The Gold Buffalo may sometimes be called the American Buffalo coin and either name is commonly accepted. This coin is very new to the gold coin market as it was only released in June of 2006. The Gold Buffalo is a 24 karat gold coin and this was the first of its kind to be released by the US Mint. The face value of the coin was $50. What really astonishes people is how much higher the actual value of the coin is than its face value. In 2006, the first of the coins were valued at around $800. And another thing that drives up the mintage is the fact that the government limit’s the Gold Buffalo to only 300,000 able to be minted yearly. The design of the Gold Buffalo resembles a nickel from all the way back in 1913 called an Indian’s Head Nickel. American James Earle Fraser is credited with the design of the coin. The obverse side depicts a native American who is said to have the facial features of three tribes called Big Tree, Iron Tail, and Two Moons. The reverse side of the Gold Buffalo has the image of a typical American Buffalo, or bison as some refer to it. Rumor has it that the actual image of a buffalo is a specific buffalo who was named Black Diamond and called New York’s Central Park Zoo his home during the 1910s. Adding to that rumor it is said that Fraser, when trying to create a good sketch of the beast, had to have someone else distract him so he would not move so much. 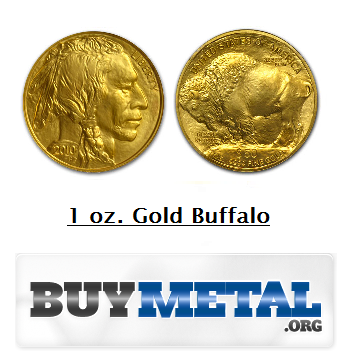 Unlike most other gold coins, the Gold Buffalo is only offered in the one ounce variety. The coin weighs exactly 31.108 grams. The diameter of the coin is measured in at 32.77 millimeters. The thickness of the coin is about 2.95 millimeters. Since the coin is 24 karat gold, that means that it has a purity of 99.99%. This makes the coin special because most gold coins actually are made up of only 91% or 92% gold and the other 8 or 9 percent are a filler metal like copper or silver in order to add strength and durability to the coin. A 24 karat gold coin is going to be fairly softer than a 22 karat gold coin. A Gold Buffalo is yet another one of those coins that are great for both investors and collectors. When collectors take an interest in the coin, the look particularly at the design of the coin. Clearly it is very close in likeness to a coin that existed almost one hundred years and this alone makes it a part of American history. Collectors, especially American collectors jump on this coin quicker than most. For investors, buying the coin is irresistible because you can directly invest in the gold in the coin. Unlike most gold coins, the Gold Buffalo is entirely made of gold and has no filler metals is in it. This inevitably drives up the value as well as demand for the Gold Buffalo.